Alexandre Dinerchtein 3P won his first Russian Championship. Playing in Russian Championships for the first time in several years, Dinerchtein swept the tournament with a perfect 7-0 score. Ilya Shikshin was the second with 6-1 and will represent Russia in the 2011 World Amateur Go Championships (WAGC); Oleg Mezhov scored third with 5-2 and will play for Russia in the 2011 Korean Prime Minister’s Cup (KPMC). All the three are the teachers of Insei-League.com. Dinerchtein had to bypass the Championships in recent years as being a pro he couldn’t have a right to represent Russia in international events like the WAGC or KPMC, but since 2010 he can play for Russian team in the European Team Championship. 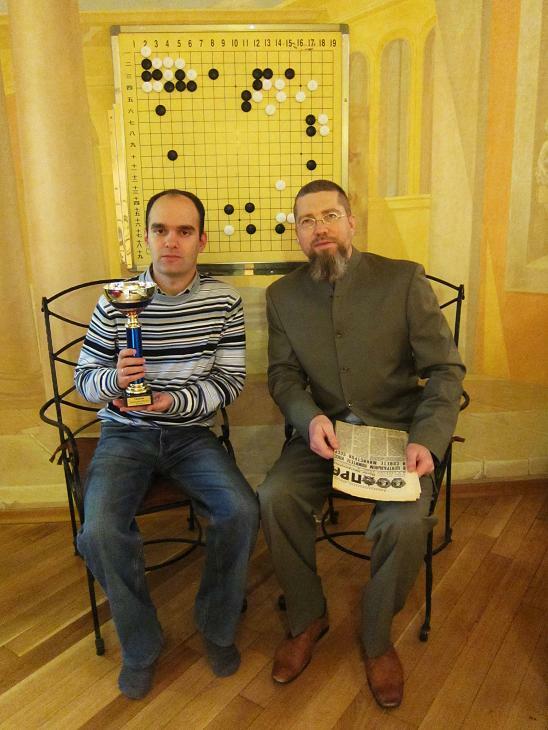 The Russian Championship — held on November 27-28 in St Petersburg — also premiered a new type of live broadcast on KGS with one board each round open for all to watch (see EuroGoTV3 account profile on KGS for game records) and the other — with live comments in Russian by a dan player — to members of the Russian Go Federation or Insei-League.com, or those who paid a $15/year fee. “Many Russian Go fans were very upset because it was not possible to see this (commented) game live,” reports Dinerchtein, who suggested the idea. However, with less than 10% of players attending Russian Go tournaments being members of the Russian Go Federation, Dinerchtein hopes that this special access for members to live games and dan commentaries will help the Federation to increase the number of members. “It’s a very bad situation,” adds Dinerchtein.”Go fans like to watch games of top players free of charge, but they don’t want to support the Federation in any form.” He says he hopes that other countries will also consider this idea as a method of increasing membership.